This impressive home in Hershey not only had an existing roofing system that had begun to fade, it was also experiencing quite a bit of staining. The owners gave Middle Creek Roofing a call and we replaced the roof with GAF Timberline HD Biscayne Blue Architectural Shingles. The final product looks amazing! They are thrilled with their roof replacement, and we were happy to help! I have two or three concerns in the ceiling/walls in my home, possible due to a roofing problem. I'd like an estimate to replace the shingles at the above address. In the process of purchasing home and the roof needs to replaced. Interested in a quote for standing seam metal roof. Freeman F. E. Penn Ave.
Zenis G. E Lehman St. If you live in Hershey, PA, you're used to a humid climate that can range from very hot summers to freezing cold winters. These weather changes can wreak havoc on your roof, causing minor to serious damage that only a professional roofing contractor can assess and repair. Middle Creek Roofing is your trusted roofing contractor ready to solve and satisfy all of your roofing needs. We provide quality roofing services to Hershey, PA and the surrounding area. No matter how big or small the project, we guarantee a sturdy and functional roof that will last for years to come! Sometimes you may notice something unusual or suspect roof damage, but are uncertain what the problem is. If you need an expert to evaluate the damage and provide the best options for your roof, Middle Creek Roofing is here for you. We always encourage our clients to have their roof regularly undergo maintenance by a certified roofing contractor in order to ensure a healthy life of the roof. We offer free estimates and roof inspections, and our qualified roofing experts will walk you through the process and consult with you about the various options that will best fit your budget and needs. Even the smallest sign of damage can be an indication of more serious problems to come, so it's better to act quickly and save yourself the future cost. Your roof is one of the most important features of your home, providing protection from wind, sun, and rain. As a certified roofing contractor, we provide roof cleaning for when you need to freshen up your roof and keep it looking great, as well as maintenance service that will keep you safe and dry through any season. If the winter hits you hard, our ice melt systems, ice dam prevention, and ice dam removal will ensure that your roof keeps functioning to the best of its ability. When you need a professional opinion to help appraise the condition of your roof and locate any damage, Middle Creek Roofing is here for you with roof inspections you can trust. Sometimes it can be difficult to pinpoint the cause of a problem or determine whether something unusual could be a sign of danger. Our qualified roofing specialists will provide a fair assessment of any damage and consult with you about available options to ensure the best solution possible. 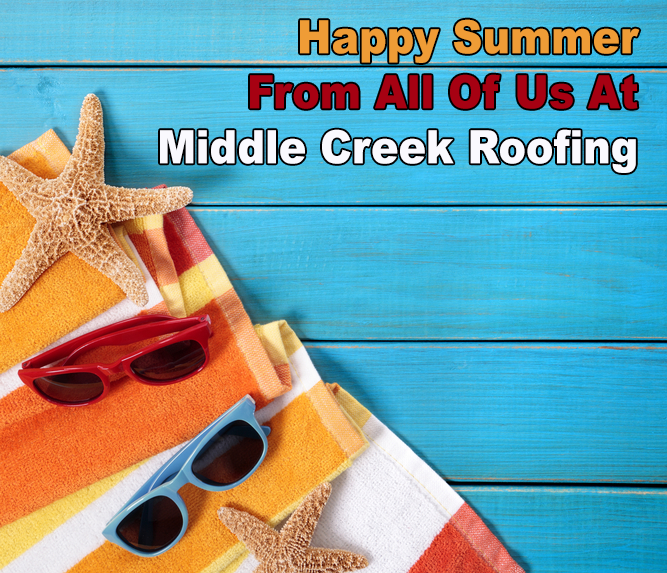 At Middle Creek Roofing, we value our customers' safety and happiness, and will keep your needs in mind through every step of the process. Our clients trust us to provide superior roofing installation, and we pride ourselves on our commitment to using the best tools and roofing materials available. Contact us today for a roof inspection or roof replacement in Hershey, PA! We are Greater Montgomery County, Chester County & Nearby's most dependable Amish roofing contractor! Now that the roof work has all been completed, the homeowners can now enjoy the look of their new roof replacement. With the use of GAF shingle on the house, there roof is sure to last them. These Hershey, PA homeowners got in touch with us and received a free estimate for their roof replacement. After all the work was done, they now had a roof that that will last them for many years to come. The different levels are no problem for our crew. We can make seamless roofing lines to give your home that beautiful aesthetic look that you have been searching for.